Prague's Holešovice neighborhood is a dining desert. I know a few people who work in the area, and they are always bemoaning the dearth of good eating options. 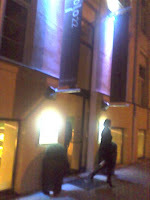 Not long ago, Molo 22 opened up. It certainly has the modern looks that match the direction this fast-changing section of the city is taking. It's across the street from the popular dance club, Mecca. The Molo 22 interior had an eclectic mix of hardwood floors, hardwood walls, electric green accents, aluminum duct work, rope-wrapped support columns, and some brick. The dark browns of the solid furniture and the greens of the plants fit in with the surroundings. My mobile phone camera doesn't give as much detail as my pocket Canon. But you get the picture. I went with G-Man and a few of his colleagues who work nearby. The menu was all over the map -- Thai, Greek, Indian, Czech, American, Italian, Chinese, and Japanese. 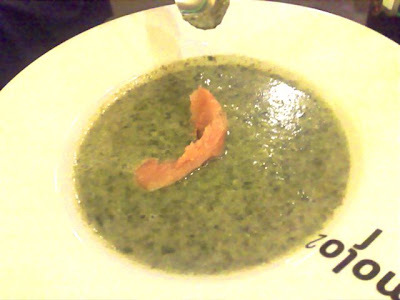 One person tried the soup -- a spinach cream with smoked salmon (47 CZK). I didn't try it, but she said she was not impressed. 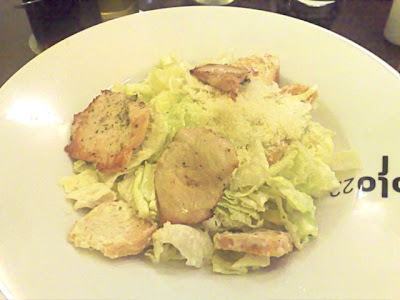 Another colleague had the Caesar salad with chicken nuggets (144 CZK). It was a sad looking thing, made with iceberg lettuce instead of Romaine. She said it was too salty and was disappointed at how little chicken there was. I really have to wonder how someone could plate that and call it a Caesar salad. The price, considering the small size and low quality, was pretty outrageous. 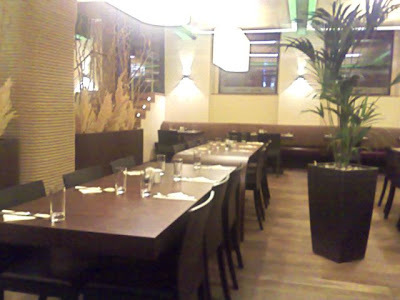 I had "Hoi Sin" chicken (144 CZK) with jasmine rice (35 CZK). 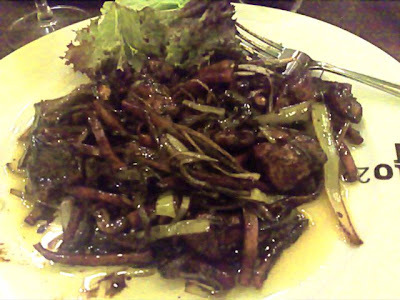 It came with lots of vegetables, including green onions, and red and green peppers. There were also a few peanuts. The dish was almost too salty to eat. Mixing in all the rice didn't help much. The menu described the sauce as slightly sweet and Japanese. It was neither. According to Wikipedia, hoisin is a Chinese condiment, and the word is a romanization of the Chinese word for seafood "海鮮" as pronounced in Cantonese. I poured the sweet sauce from someone else's dish on mine to make it more palatable. 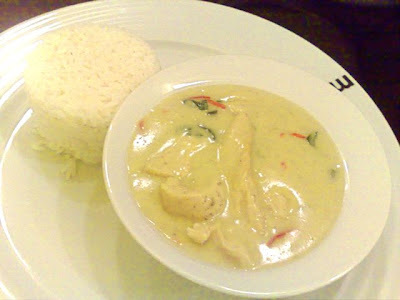 G-Man had the Thai green curry chicken with chicken (171 CZK) and jasmine rice. It was super spicy. Once the fire died away, there was little left to talk about. The sauce was basically a salty coconut cream. 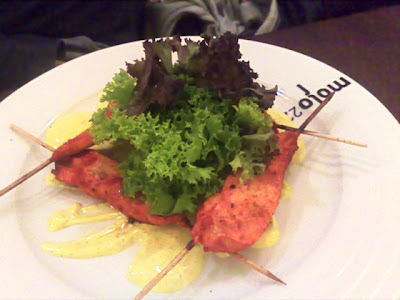 G-Man'ss boss had the Tandoori chicken satay with yogurt curry sauce (149 CZK). He said it was good. 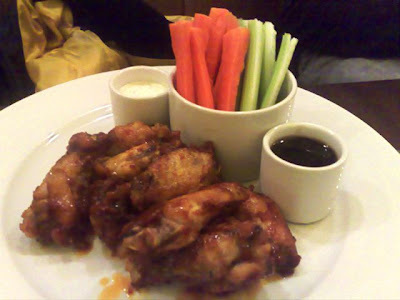 Another colleague tried the hot chicken wings (154 CZK). The seven wings were not too spicy. She ate them all and I didn't hear any complaints. Molo 22's beer offerings were my least favorite -- Staropramen and Stella Artois. I had a half-liter of Stella (44 CZK). Unfortunately, the carbonation was not at full strength, which made it fairly unpleasant. After that, I switched to a .33 liter bottle of Pilsner Urquell (39 CZK). The restaurant had a bar that does a number of cocktails and where smoking was permitted. Overall, there were a few things that were adequate, but some others that were just wastes of time and money. Perhaps the chef never sampled properly prepared versions of these dishes. Or it is possible the kitchen was aiming more for the Czech palate than anything resembling authenticity. For the sake of the neighborhood, I hope this restaurant realizes its ambitions were too high, its quality too low, and that they used too many grains of salt. Until then, this writer will avoid eating there. Been around there, Pivní Galerie is few metres down the street, wouldn't go in for the life of me, and not only because of their beer choice (which is enough to keep me away, the "poshmodern" look of the place, pretentious and designed by a computer and not by a person is really unwelcoming. I think the quality of the food pairs really well with the it. 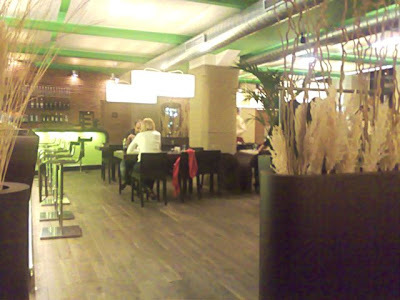 Hello, we moved to Holešovice recently and also found that there are very poor dining choices there (do you have any tips??). We visited Molo22 out of curiosity and were pleasantly surprised - vepřová panenka (pork loin?) was excellent and the chili goulash was also good. However, that's just one visit and I wouldn't judge upon that.